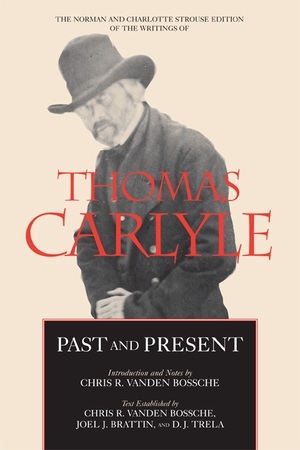 Thomas Carlyle (1795-1881), Scottish essayist, historian, cultural critic, and leading man of English letters during the Victorian era, published Past and Present, one of his most influential works, in 1843. Written as a response to the economic crisis of the 1840s—closure of factories, loss of jobs, the growth of slums in industrial centers, the starving poor—Past and Present aimed to lead readers toward a "conversion experience" in order to stimulate social reform. In this work, Carlyle provides a trenchant articulation of the political, social, religious, and economic climate of the mid-nineteenth century and a prophetic vision of the future. This volume, the fourth of the eight-volume Strouse Edition, includes an informative historical introduction and illustrations, along with complete notes and scholarly apparatus, and is the definitive modern scholarly edition. Chris R. Vanden Bossche, Professor of English at the University of Notre Dame, is the editor of Carlyle's Historical Essays (California, 2002) and author of Carlyle and the Search for Authority (1991). Joel J. Brattin, Professor of English at Worcester Polytechnic Institute, helped establish the text for Carlyle's On Heroes, Hero-Worship, and the Heroic in History (California, 1993). D. J. Trela, Professor of English and Dean of the College of Arts and Sciences at the University of Michigan, Flint, is author of A History of Carlyle's "Oliver Cromwell's Letters and Speeches" (1992).